It's been a while since I've grown a decent watermelon. Years ago, We grew amazingly sweet and crunchy Korean watermelons, but alas, the seeds I'd saved from that planting are no longer viable. This year, I'm growing an heirloom variety - 'orange tendersweet' and so far so good. I added a good helping of manure to the plant holes and covered the entire raised bed with black landscape fabric to keep the soil most and toasty. 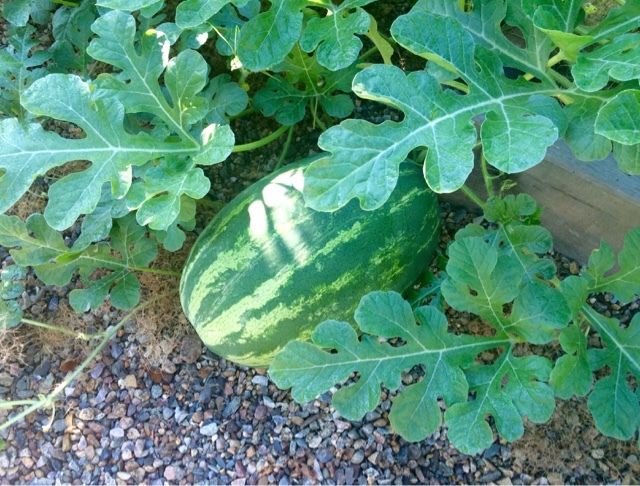 The melons themselves are a good size at this point and the leaves still look perfectly healthy despite the few cucumber beetles that make their way through our garden. Hopefully they will be ready to harvest by month's end. I feel hopeful. It looks lovely. I've yet to try growing watermelon. So far I've just grown small melons which makes it easier for me to eat it all. Boy, that watermelon is huge - I have a feeling your efforts on this one will be met with success. I haven't even tried small melons yet...I'm still working on growing some halfway decent squash before I attempt the more members of that family. That's a beauty you have there! We have neither the warmth or the frost free time required for watermelons--but that never stops me from trying. There has to be a year sooner or later that this pans out for me. Your melon looks terrific. Best of luck! No melons for me this year. The deer saw to that when they munched on the plants just as they were vining out. Even when I do grow melons, they never look as magnificent as yours. What a beautiful melon!